What could be more iconic than a classic football shirt? What could be more anti-establishment than '70s punk rock? Two distinct worlds collide in the Nike x Kim Jones Men's Short-Sleeve Football Shirt, a poly-knit top handcrafted in Italy for an artisanal aesthetic. Distressed, iridescent graphics and raw edges channel Kim Jones' old-school English punk heroes, while a traditional football-shirt silhouette nods to Nike kits of pitches past. What could be more iconic than a classic football shirt? What could be more anti-establishment than &apos;70s punk rock? 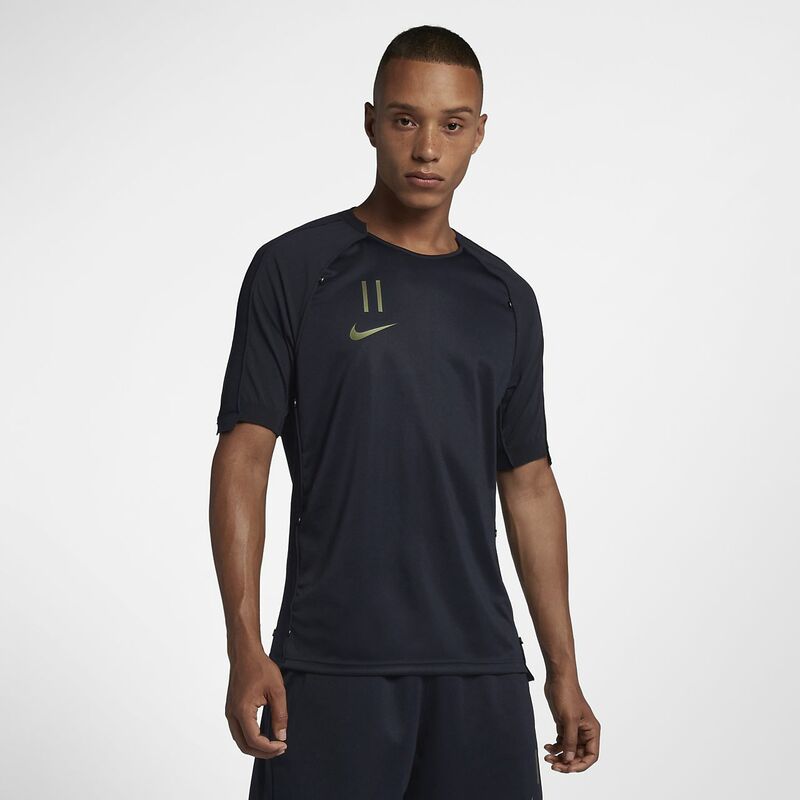 Two distinct worlds collide in the Nike x Kim Jones Men&apos;s Short-Sleeve Football Shirt, a poly-knit top handcrafted in Italy for an artisanal aesthetic. Distressed, iridescent graphics and raw edges channel Kim Jones&apos; old-school English punk heroes, while a traditional football-shirt silhouette nods to Nike kits of pitches past. Fabric: Body: 100% polyester. Sleeves: 100% nylon. Insets: 96% nylon/4% elastane. The roar of a crowd, clashing bodies, sweat and strain, a shared cause—perhaps punk rock and football have more in common than first thought. At least that&apos;s the approach of renowned designer Kim Jones, whose unconventional ethos takes centre pitch in the Nike x Kim Jones Collection. Handcrafted in Italy, this capsule brings together two unlikely yet globally renowned influences—&apos;70s London punk rock and the game of football. Classic sport silhouettes and a raw aesthetic combine for fans to rejoice—the Nike x Kim Jones kit is anything but mainstream. Have your say. Be the first to review the Nike x Kim Jones.